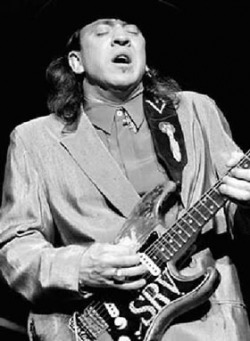 Stevie Ray Vaughan is one of the world's most influential electric blues guitarists. Known for his warm blues rock tone, Vaughan characteristically used very heavy strings on his guitar ranging from 11 to 16-guage sets to give a fuller sound which he tuned down a half-step to the key of E-Flat. In 2003, Rolling Stone magazine ranked Stevie Ray Vaughan #7 in their list of the 100 Greatest Guitarists of All Time, and Classic Rock Magazine ranked him #3 in their list of the 100 Wildest Guitar Heroes in 2007. As a child Vaughan wanted to play the drums as his primary instrument. But a friend of his gave him a guitar. Plus his older brother was a major influence on him playing guitar. Watching his older brother play and seeing what could be done on a guitar inspired him. As a kid he would play the guitar so much that his finger tips would split open and start bleeding, but that didnt stop him. He put some super glue on his fingers and kept on playing. Now that is true love for the music! Vaughan's first band was Paul Ray and the Cobras, but when a couple of the members quit, the three that were left called themselves Double Trouble. Vaughan would then become lead guitar and lead vocals.